Did you know that we have a full-time agronomist on staff? Lucas Kelly is not only completing his CCA certification, but he is also a master of precision ag technology. Last week, we sent him to Minnesota Crop and Soils Day at his alma mater, the University of Minnesota - Crookston, to spend the day learning and discussing agronomic trends and issues. Read about his day, in his words, below! "On Wednesday, July 18th I was able to attend the University of Minnesota Crop and Soils day in Crookston, MN. Many different topics were discussed pertaining to crop production. Information primarily focused on smalls grains such as wheat and barley with some time spent talking about corn, soybeans and potatoes. The first half of the morning was spent talking about wheat and barley varieties and breeding, disease and weed management in small grains. The fist stop, led by speaker Jim Anderson, wheat breeder, talked about the agronomic traits of 30 different varieties of wheat that have been developed by companies and universities from the states of North Dakota, South Dakota and Minnesota. Topics talked about for each variety were test weight, straw strength/length, protein level, disease package and yield potential. The disease ratings for the varieties were given on a scale of 1 through 9 with a rating of 1 meaning the variety was highly resistant to a disease and 9 meaning the variety was highly susceptible to a disease. Madeleine Smith, plant pathologist, went in to detail about the diseases that have been found in the plots we were viewing. The most prevalent disease located in the plots was bacterial leaf streak which takes over the flag leaf resulting in significant yield loss. Fusarium head blight (FHB) was also noticeable in the plots. Madeleine discussed conditions favorable for disease development and best practice for the management of both diseases. The cause in the abundance of bacterial leaf streak in the plots was due to hail and wind damage to the flag leaves. High moisture, humidity and dew levels were very favorable to disease development for both bacterial leaf streak and FHB. A new chemical by Syngenta is expected to be released next year called Miravis Ace. This fungicide is supposed to allow a grower to make an application with 50% head emergence and still maintain the same control as a chemical that is applied at full heading at 50% flowering. University research has been advising growers to still follow the rule of full head emergence with 50% of the head flowering until more thorough testing has been completed. Growers have been reporting seeing a lot of FHB in their fields, but after further examination there have been two other reason for seeing the symptoms that look like FHB. The first one is wheat stem maggot which eats its way through the stem causing the head to die off. To test if this could be a possibility, pull lightly on the head. If it can be pulled out easily there should be noticeable chew marks on the end of the straw. The second similar looking symptom is root rot which has become prevalent now with the hotter and drier conditions we have been experiencing. To test for this, pull at the base of the plant. If the plan comes out of the ground easily, inspect for lesions and discoloration on the roots to confirm infection. Kevin Smith, barley breeder, discussed different qualities and characteristics of six-rowed and two-rowed barley. The market is moving toward two-rowed barley for its malting qualities. Beverly Durgan, weed scientist, took us through plots to discuss the effectiveness of wild oat and broadleaf herbicide products for small grains. She discussed what chemical and rate to use for the best control of wild oats and then discussed the best product and rate to use to control the broadleaf weeds. Timing is important for getting full control of the weeds but spraying too early could result in having to make a second application. Waterhemp is one of the late emerging broadleaf weeds that can be a problem if the first application is made too early in the season. Jochum Wiersma, extension agronomist, spoke about the rising population of sawflies that have been causing significant losses in small grains. They cause such high losses because there is no chemical, biological or mechanical control for this pest. The sawfly larva is what’s causing the destruction. The larva overwinters in the soil then begins to eat their way up the stem during the summer, causing the straw to weaken and the crop to appear lodged. To confirm the damage is from the sawfly larva, cut the stem the long way and inspect for something that looks like sawdust in the stem. As of now, the best practice to combat against this pest is to plant solid stem varieties. Jochum also talked about spraying plant growth regulators on small grains to keep the plants shorter and stronger to be able to handle the higher yields that growers are trying to achieve so that the plant does not become too top heavy and lodge. J Stanley spoke about seeding rate recommendations for HRSW varieties. With each variety having unique characteristics and everyone having different soil types and growing environments, the grower should base their seeding rates from their own knowledge of the variety and soil to achieve maximum yield. Angie Peltier spoke about the rising populations of soybean cyst nematode (SCN). Cyst nematode was found in Minnesota in the 70’s and has been on the move since then. They spread by the movement of soil on equipment, boots or by wind and water. 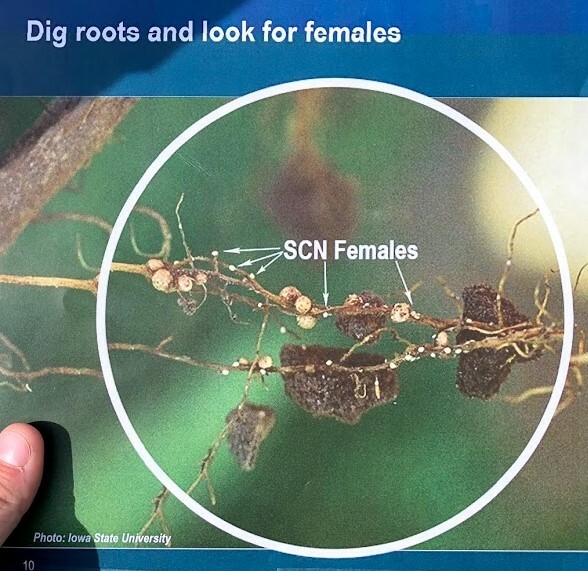 Female cyst nematodes are what can be found on the plant roots that can result up to a 30% yield drag without any signs or symptoms of infection. They can be identified by carefully digging up the plant and looking for small white/yellowish specks on the roots. If the grower knows they have SCN, the best way to combat this pest in future years is to plant a resistant variety. Ian MacRae, extension entomologist, said that there have been some populations of Colorado Potato Beetle that have developed resistance to certain insecticides, so monitor potato fields closely for any insect escapes. He mentioned that southern Minnesota has seen treatable levels of aphids and that we should be monitoring fields if growers have not already been doing so. If treatable levels are found (greater than 250 aphids/plant) make an application but if another application is needed, make sure to try a different mode of action, to combat against developing resistant aphid populations. Aphid resistance to pyrethroid insecticides has been confirmed so make sure to keep an eye on fields to monitor for any escapes. Applications made for aphids should be made with at least 10 gallons of water per acres with high application pressure and a fine spray droplet to get good coverage and canopy penetration. Gabriel Paiao and Jared Spackman, program researchers, spoke about managing fertilizer applications in corn/soybean and corn/corn rotations. Their studies showed that spring applied nitrogen performed better than fall applied. They also had better results with performing a split application instead of the full rate with one application pass. The reasoning behind this is that good mineralization throughout the growing season may reduce the amount of nitrogen that needs to be applied in-season, and in some occasions might eliminate the in-season application all together, while still maximizing the corns yield. Over applying and making an unnecessary in-season fertilizer pass is an added cost that could be avoided and result in a more profitable year from the reduced cost." Lucas Kelly is an Integrated Solutions Consultant at True North Equipment. His specialty lies at the intersection of agronomy and precision ag.